Heat oven to 350°F. Spray 11x7-inch (2-quart) glass baking dish with cooking spray, set aside. Into 4-quart microwavable bowl, pour contents of both bags of broccoli and sauce chips. Cover bowl; microwave on High 15 to 25 minutes, stirring every 5 minutes, until sauce chips are melted and broccoli is thoroughly cooked and tender. Meanwhile, in 10-inch skillet, cook bacon over medium-high heat 7 to 9 minutes, stirring frequently, until bacon is browned. Remove bacon to paper towel-lined plate. Drain all but 1 teaspoon bacon drippings. Decrease heat to medium. In same skillet, cook onion in 1 teaspoon bacon drippings 3 to 4 minutes, stirring frequently, until onion is tender. Stir bacon, onion and mustard into broccoli mixture; spread in baking dish. In small bowl, stir together corn flake crumbs and melted butter. 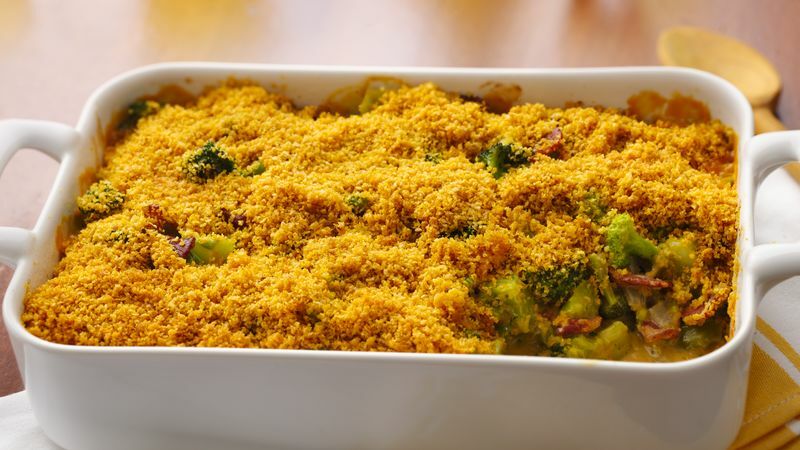 Sprinkle on broccoli mixture in baking dish. Bake uncovered 25 to 30 minutes or until hot and topping is light golden brown. For added color, add 1/2 cup chopped red bell pepper with the onion. To make ahead, prepare as directed through end of step 3. Cover and refrigerate up to 24 hours. Bake loosely covered 25 minutes, stirring every 10 minutes. Make and top with crumbs as directed in step 4. Bake 20 minutes longer.